This Memorial Day I’d like to share a special story about a good buddy of mine. I’ve had the privilege of serving alongside many great men and women in the US military. To you they are the men who rescued Jessica Lynch, Captain Phillips, and numerous other hostages from terror’s grasp. They are the men who brought Osama bin Laden to justice. They are the men of Naval Special Warfare (A.K.A. “U.S. Navy SEALs). SEAL stands for “SEa, Air, and Land”, the three means of insertion for these special operators. Navy SEALs have been awarded 3 Medals of Honor, over a dozen Navy Crosses, hundreds of Silver and Bronze Stars with Valor, and countless Purple Hearts for wounds sustained in combat since 9/11–many of them posthumously. Over 90 members of Naval Special Warfare have died in combat or training since 9/11. Their stories and heroics are memorialized in movies and books such as “American Sniper“, “The Lone Survivor“, “Captain Phillips“, and “13 Hours“. Their families have endured over 16 years of combat deployments at the forefront of the War on Terrorism. Although some of their greatest exploits have been written about or appeared in movies and documentaries, most of them never will. Many would consider them modern day superheroes. To many of us they are family members, teammates, and friends. My good buddy, Mike McGreevy, was one of them. To his family he was a great son, husband, and father. To me he was more than a classmate, a teammate, and a friend. He was a brother. Mike McGreevy would have celebrated his 42nd birthday on April 24th–the day I started writing this story. Happy Birthday, brother! I’m telling his story as an example of how we as Americans can honor those like him who have given the ultimate sacrifice. I do this in hope that their legacy will live on–beyond this Memorial Day. You probably wouldn’t believe me if I told you that Mike was number one in everything he did. Well, he was. He was always “in the groove” so to speak. That’s partly why he earned the nickname “Groove.” We met at the Naval Academy in the Summer of ’93 in boxing. He had just delivered a right cross to my nose which left me with a “distinguished” lean to the right side of my face ever since! We quickly became friends. Groove and I wanted to be Navy SEALs when we graduated. He quickly developed a reputation among us Navy SEAL wannabes as someone to watch. There were only 16 slots available to over 900 graduates to attend BUD/S (Basic Underwater Demolitions/SEAL) training. To say it was competitive is an understatement. Groove set the bar by attending Army Airborne School, Army Combat Dive School, Air Force Freefall Parachuting School, and Mini-BUD/S (pre-SEAL training)–all during his Summer breaks–and graduated at the top of almost all of them. However, upon graduation he was not awarded one of the 16 annual SEAL Training slots, which surprised most of us. As a testament to Groove’s perseverance and indomitable spirit, he did not let this setback dissuade him from his dream of becoming a Navy SEAL. 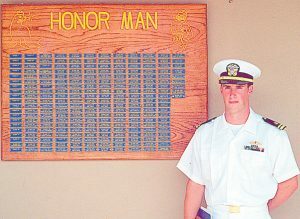 Instead he went out to the Surface Navy, served honorably on a ship, and was awarded a transfer to SEAL training two short years later. Our paths didn’t cross again until Groove was on his second SEAL deployment in Africa in 2003. It was a voluntary deployment for him. Only half of his task unit needed to deploy for 3 months on top of the 6 months they had just completed overseas. Of course Groove volunteered. 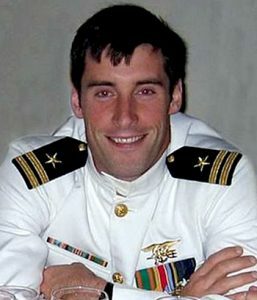 He epitomized what it meant to be a selfless SEAL officer. We had a lot of fun together over those few months. Between missions we’d roll against each other in jiu-jitsu, lift weights, and drink beers when our schedule allowed. He had recently gotten married and just had a baby girl and never stopped talking about his new family. I remember feeling very happy for him. 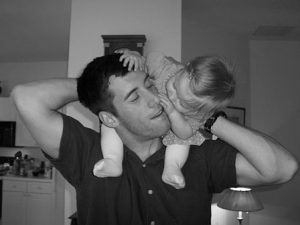 He returned home and deployed yet again a little over a year later–this time to Afghanistan. Sadly, I’d never see my brother Groove again. Undoubtedly many of you have either read the book or watched the movie “The Lone Survivor” which told the ill-fated story of Operation Red Wings in Afghanistan. On June 28, 2005 four of Groove’s teammates were pinned down by the Taliban in a fight for their lives. Groove and his SEAL squad, a Quick Reaction Force (QRF), immediately launched from base and flew to assist their comrades under fire. This type of mission is the most dangerous because the enemy knows you’re coming. As fate would have it the QRF Chinook helicopter was shot down on the way into the landing zone killing Groove and 15 other Americans aboard. Only one SEAL survived the entire mission. Marcus Luttrell, the lone survivor, survived in part because of the diversion that Groove and his men made for the attacking Taliban force. Groove was gone, and he left behind his wife, Laura, and his one-year old baby daughter. Ask any veteran how they would like to be remembered in combat and most will tell you they would like to be remembered for living up to the expectations of their teammates. To guys like Groove there is no greater fear than the fear of failure–the fear that you’ll let your guys down. After that their next biggest concern is ensuring that their family is taken care of and not forgotten when they are gone. Since the day that Groove and so many of his teammates gave the ultimate sacrifice many of us have made a special effort to keep their memories alive. In Groove’s case in particular many of us continue to stay in touch with his family. It was during one of these conversations with Groove’s wife, Laura, that we learned our help was needed. Groove’s daughter was turning twelve, and she started asking her Mom a lot of questions about her Dad. She was only a year old when her daddy died. She only knew him through photos and stories. Imagine having an amazing Dad such as Groove and never having the chance to get to know him? It’s truly heartbreaking. Groove’s daughter wanted to know more about him. What was he like as a person or as a leader? Why was he so great at everything he did? Did his teammates respect him? Was he always as happy as he looked in photos? What advice would he have for her as she entered her teenage years? Many questions, but never enough answers for a young 12 year-old girl seeking to find meaning in her father’s death–and meaning in her own life. Fortunately Groove’s buddies knew the answers. We just had to figure out a way to relay all of these stories and pieces of her dad that we were lucky enough to hold onto to her. A bunch of calls were made, and I was able to track down 16 of Groove’s closest SEAL and Naval Academy buddies. However, everyone was spread all over the globe. How were we going to capture the stories and memories we had of Groove and share them with his daughter? How were we going to tell his 12 year-old daughter some of the most intimate memories we had of her father? Would we send emails or letters? Writing a letter or a very personal email is just not easy for many of us to do. We’re not great writers, and many of us are incredibly busy in our professional and personal lives. Some say a photo is worth a thousand words, but photos don’t talk. Besides, we grew up in the age of disposable cameras, and we didn’t take a lot of photos. Even those of us who had photos couldn’t find them because they were hidden in a storage unit or in our parents’ attics back home. Video is awkward and requires a lot of preparation to deliver a nice result. You also have to be comfortable in front of a video camera. It may come as a surprise to you with all of the SEALs in the media nowadays, but most Navy SEALs just aren’t comfortable having a video camera in our faces! True quiet professionals, which most of us are, don’t enjoy being the focus of attention. Would we meet her in person? I tried to get everyone to jump on a plane and meet at my house. Half of the guys were deployed and were unable to attend. Other guys couldn’t nail down their schedule that far in advance. I’m not used to failure, but I have to admit that I was at a loss. How was I going to pull this off? This was too important to screw up, and I didn’t want to let Groove’s daughter down. 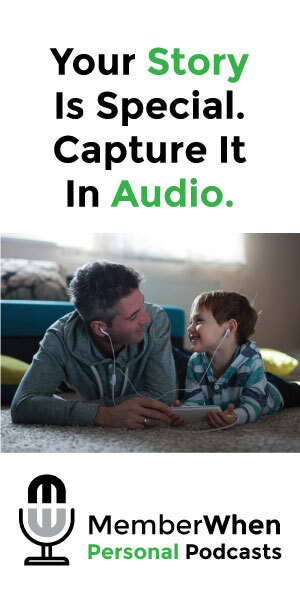 My wife and I searched and found a company which offered a unique way to capture audio stories. They have trained journalists that record phone conversations with all participants involved in capturing the story. They pass along the best audio to an editor who turns it into a customized story which can be shared among friends and family. We found it when we gifted one of their products to my Mother for her birthday. My wife suggested I give them a call to see if they could do a custom project for Groove’s daughter. I contacted the company, and they said yes. Within two weeks they had interviewed eighteen of Groove’s buddies. A week later they sent me the final product complete with narration and music. I listened to it and was overwhelmed with emotion. The stories brought back so many memories. I sent it to all of the guys to see what they thought. They all loved it too. We couldn’t believe how easy it was to capture all of our stories and memories of Groove in one place–with just a simple phone conversation. The final audio product perfectly captured the legacy of Groove for his daughter. Eight of us met Groove’s family in Annapolis, MD this past October. 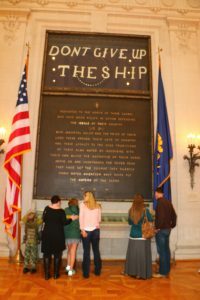 We toured the Naval Academy and showed his family where we trained with Mike for four years. Following our tour we went to one of our favorite local crab shacks to bust open crabs and drink a few beers. At the end of dinner we raised a toast to Groove and gave his family the audio story gift we put together for them. Groove’s family listened to it on their drive home the next day, and Laura told us it was the perfect gift for their daughter. Anytime she wants to hear a few stories about her dad or know what advice her dad would have given her, all she has to do is just click the play button and listen to the men who knew her dad best. I can only hope that Groove is looking down on us and that we have lived up to his expectations as friends and teammates and continue to do so in the future. It’s the least we can do for such an amazing friend–and his incredible legacy–his family. Following our weekend in Annapolis the founder of MemberWhen, the company that delivered our memorial tribute podcast, asked me for feedback on our purchase. I met him for coffee and left with an offer to be his Chief Operating Officer. I am excited to be part of a company which helps people capture their favorite stories and memories. I believe that everyone can benefit from telling their stories, and my goal is to make it easy for everyone to do it. Fly the flag. Remember all of those American flags after 9/11? There’s nothing more beautiful to a fallen service member’s family (and to all veterans) than the American flag proudly waving in the breeze. I feel an awesome sense of patriotism when I see Old Glory flying atop the flagpole on Main Street. Join or support an organization such as the American Legion or Veterans of Foreign Wars placing flags on graves at military cemeteries. Check out the Wreaths Across America website for ideas on how to support their December mission of placing a wreath at the grave of every fallen service member. Donate to a foundation supporting wounded veterans and the families of the fallen such as the Navy SEAL Foundation, Fisher House Foundation, or the Navy SEAL Family Foundation. Participate or support events honoring Memorial Day such as the Carry the Load walks across the USA. Support the Travis Manion Foundation “Character Does Matter” ambassador program teaching and mentoring youth on leadership and character. Teach children the incredible stories of our fallen military heroes by reading the Honor the Fallen page of the Military Times website, the Our Fallen Heroes page on the Navy SEAL Foundation website, or the Recipients page of the Congressional Medal of Honor Society website. Goodreads.com also has a great list of books to read about stories from the wars in Iraq and Afghanistan. Do a Memorial Day workout with your children or friends. My buddies at Crossfit have done a great job honoring our fallen heroes with a “Workout of the Day (WOD)” in their name. Groove has one called “Michael” (although I would vote to change the name to “Groove”)! Another popular one is called “The Murph” in honor of Mike Murphy, one of the SEALs that Groove was attempting to rescue when he died. 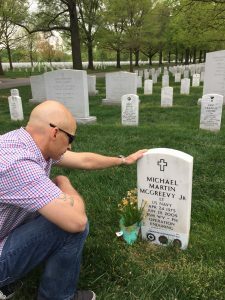 Make a small donation to a fallen hero scholarship fund such as the Mike McGreevy Memorial Scholarship Fund and give our future leaders the support they need to get an education. Any amount is helpful. Even a $10 donation goes a long way when you consider thousands of people donating. Before I finish, I’d like to leave you with two special gifts. 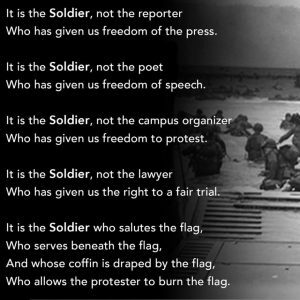 My first gift is a poem explaining why we should be thankful for our fallen service members this Memorial Day. I’d like to add that it is a privilege as a military member to serve the American people. Whenever someone thanks me for my service I like to reply with a line I stole from my buddy, Clint Bruce. I just say “You were worth it.” And you are worth it. My second gift is a short audio story we put together at MemberWhen. It’s a sampling of the larger audio memorial I mentioned earlier in the article. It’s only 10 minutes long, but it captures the essence of what made Groove so amazing. The power of the human voice is immeasurable in storytelling. Listen to the men who knew Groove best as they share some of their memories of him. Although it’s great to hear the voices of my teammates, I really wish I could hear Groove’s voice just one more time. To help honor Groove, please visit the Mike McGreevy Memorial Scholarship Foundation website and donate. No donation is too big or too small. You are also a Standard Bearer! Great Job! I sent this to all the addresses of old guys from JSOTF-HOA, that I still have. Mick, Thanks for the comment! Glad you enjoyed Groove’s story. It’s definitely a good one. Hope you had some time to reflect on all of the great people we’ve known who have made the ultimate sacrifice for our freedom. Thank you so much from the bottom of my heart for this. Mike’s mom Pat sent me the full audio and I had the distinct pleasure of listening to every story. I had tears, laughter and just an overall feeling of Brotherhood from all of you. I know this meant the world to Laura and their daughter as well. If you’d ever like to be a part of our McGreevy Run the last Saturday of each July you’re always welcome in Portville, NY. We’d love some story telling. High school friend and continued family friend/Race Director. Tracy, Thanks for your heartfelt comment. It was great meeting you the other night at Groove’s foundation fundraiser. Looking forward to doing the 5k run with all of you one of these days. Glad you enjoyed the story, and I’m happy his family enjoyed it too! All so true about Mike! He was the best friend to my two sons and I thought of him as a son. Always very polite, a great guy. I think of him often and miss those days when the kids hung out together. Very trustworthy as a teenager. Greatly missed! Brenda, Thanks so much for commenting on Groove’s story. He was truly one-of-a kind, and I hope we were able to capture how great he was in this story. He’s a great role model, and we can all learn from his story. I miss him greatly too! Mary, Thanks so much for taking the time to post your comment. Groove was truly a great American, and I’m blessed to have known him and other great servicemen like him. I hope we were able to capture his story in a special way for his family and for everyone else (like you) who were able to hear it. Well Done, JJ!!! You did a great thing here. Thank you! Tarey, Thanks so much for your comment. As you know, Groove was the one who did the greatest thing here! It’s a great honor for us at MemberWhen to be able to capture the voices of 18 of his closest friends to help tell his story. What a beautiful tribute to your friend, Mike McGreevy. It literally brought tears to my eyes. I can only imagine the smiles and joy this gift has given to Mike’s wife, Laura, and their 12 year old daughter as they listen to this audio. Beautifully done! Good job to all! Best gift ever! Eileen, Thanks so much for your beautiful comment. I’m glad Groove’s story touched you the same way it’s touched all of us. I hope we were able to honor his sacrifice appropriately and share his story with as many people as we could. It’s a great privilege to do so! Excellent tribute to a hero. I really enjoyed listening to this…thanks for sharing J.
Nick, Thanks so much for taking the time to comment. We’re very happy that you enjoyed Groove’s story. He was indeed a hero, and it’s a great honor for us to be able to help tell his story in such a unique way–in the voices of those who knew him best. Glad we were able to share it with you. Bob, Your quote is definitely apropos when considering what men such as Groove have done for us. I’m glad you enjoyed the read (and listen). Thanks for taking the time to respond to my article!